We have developed a love for oven roasted chicken at our house. 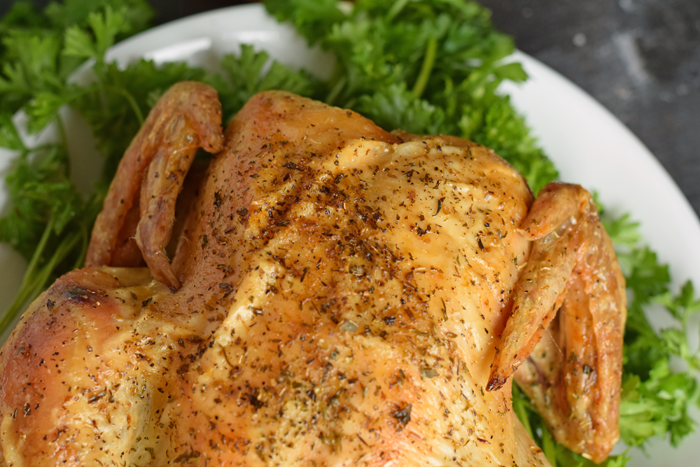 Previously, I had been buying the rotisserie chickens that were pre-made at the grocery store, but I wanted to be able to control the ingredients and seasonings that I was using. Now, this is the recipe that I use all the time. I make a minimum of one a week for dinner. I’ve been doing this since March, and I’ve slowly perfected my cooking method until I can prepare a chicken for roasting in no time. 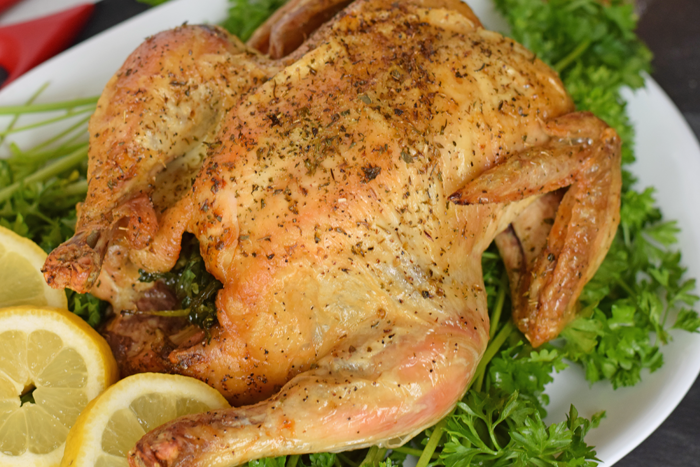 The skin texture is exactly like the rotisserie chickens at the store, without having to use an actually rotisserie! However, no matter how many chickens that I make, I’m not sure that I’ll ever get accustomed to the cleaning of the chicken and the cleaning of the pan after roasting. 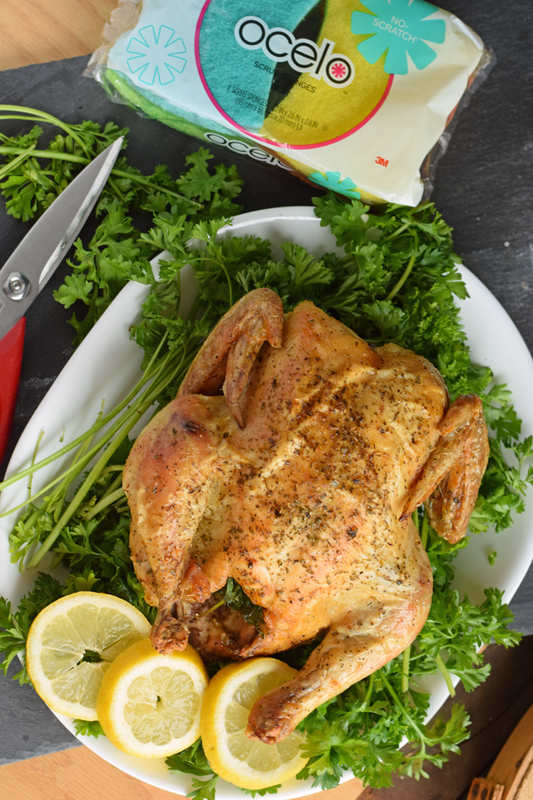 I’ve even read a few food bloggers who purchase aluminum pans to use and dispose every time that they roast a chicken just so they do not have to clean up the pan! I’ll stick to my handy dandy roasting pan and ocelo™ No-Scratch Scrub Sponges for clean-up. Update: So, a reader brought it to my attention that I should not have used the word “rotisserie” in the title. Yes, I am aware that this is a roasted chicken. Yes, I am aware that a true rotisserie chicken is made on a rotisserie. The intent, as I mention in the first paragraph, is that the chicken will resemble a chicken that has been cooked on a rotisserie. Perhaps “Perfect Oven Roasted Rotisserie-Like Chicken At Home” would have been better. Preheat the oven to 425 degrees. Remove the chicken from the packaging, and then remove the giblets and other parts from the chicken cavity. Rinse the chicken and pat dry with a paper towel. Place the chicken on the roasting rack within the pan. Rub olive oil over the entire chicken. Generously sprinkle Himalayan salt and pepper inside the chicken cavity and all over the outside of the chicken. Stuff the cavity of the chicken with fresh oregano. Sprinkle the outside of the chicken with Italian seasoning. Roast at 425 for 25 minutes. Reduce the heat to 350 degrees. Roast until the chicken has reached an internal temperature of at least 165 degrees. A meat thermometer is crucial here, and I actually roast mine until 175-180. I’ve found that letting them heat to a higher temperature insures that the very middle of the chicken is cooked completely. After dinner is over, it’s clean-up time. Sigh. Is there any one out there who enjoys cleaning up the roasting pan? I grabbed the new non-printed ocelo™ No-Scratch scrub sponges at Target recently. They are great for cleaning non-stick cookware without scratching. 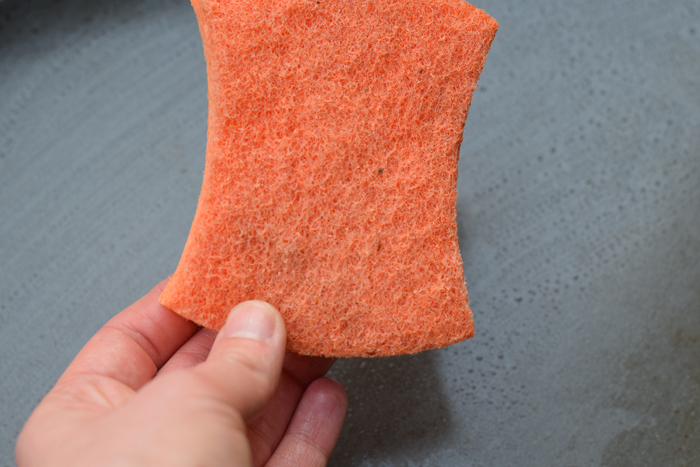 There is a no-scratch scrub side and a sponge side. 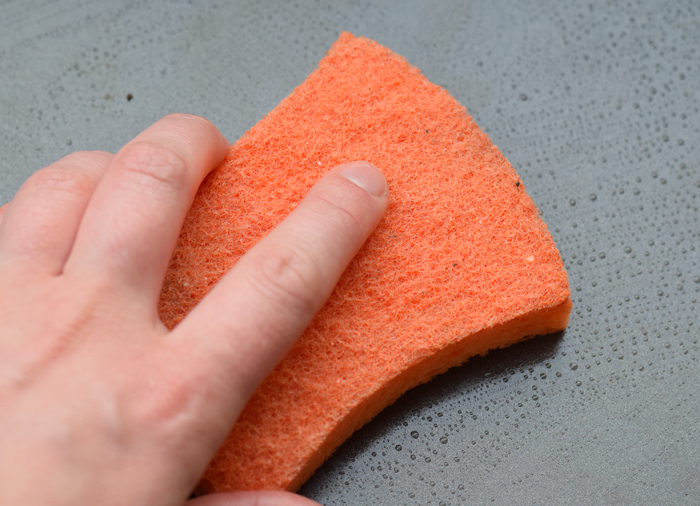 The no-scratch scrub side is awesome for pulling up tough messes on the pan while the sponge side helps to wipe it away. The 4pk Non-Printed are $3.99 at Target, but you can save even more with the Save $0.50 off One ocelo Scrub Sponge Multi-pack online printable coupon offer. 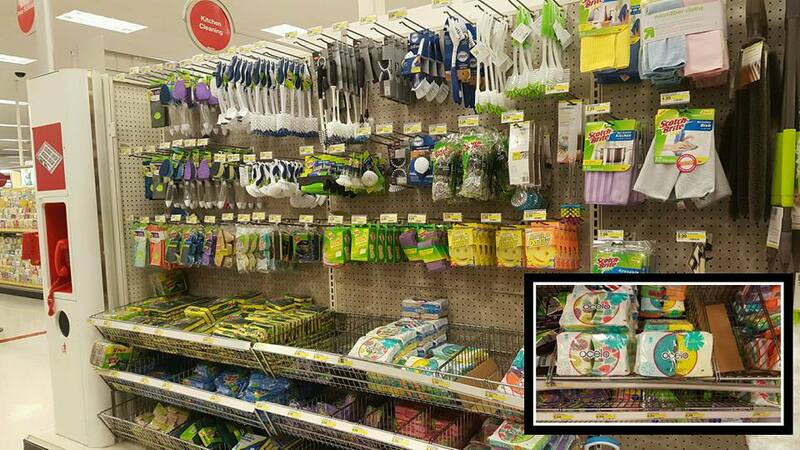 Find the ocelo™ No-Scratch scrub sponges in the cleaning section at Target. From August 14-20, spend $50 in the cleaning department and receive a $15 Target gift card. 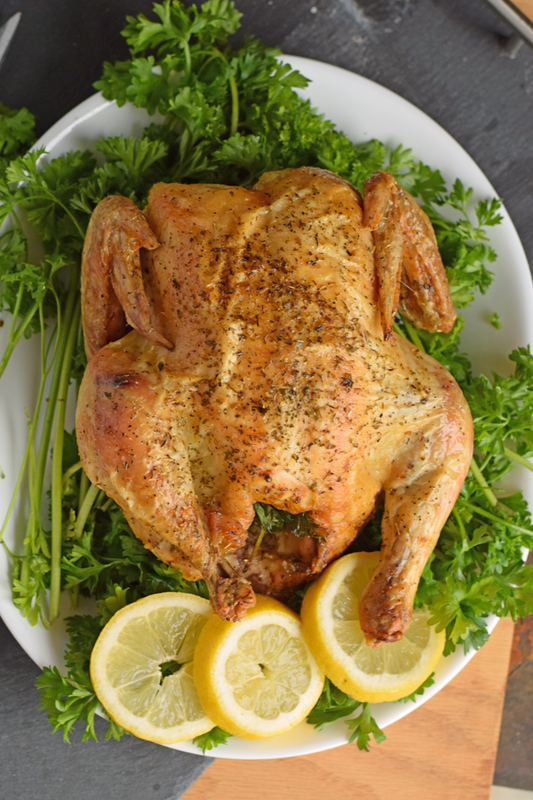 Have you ever made an oven roasted chicken at home? How do you clean up your mess? I have always been intimidated to make a whole roasted chicken, but I may have to try it now! I love the Ocello brand sponges! I actually have not made a oven roasted chicken before! It sounds much easier than I thought! 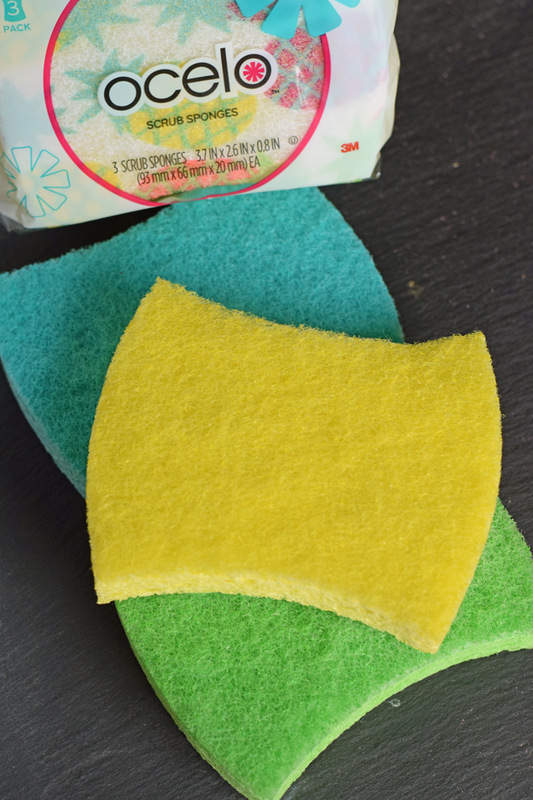 I love how easy the Ocello sponges make cleanup a breeze!! I am loving the sound of this recipe!!! Great family dinner!! Love this, I too have never made one before. And these sponges are so great! Thanks for the inspiring idea. I cook in a church kitchen once a week and we sometimes line the roasting pans with aluminum foil which helps to keep the pans from getting as dirty. 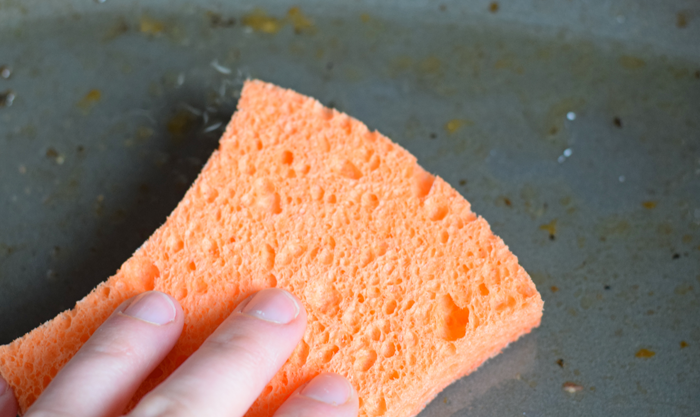 Also BAKING SODA sprinkled in the dirty pans and covered with hot water will soften and loosen most of the residue if left to sit for a few minutes. I sometimes leave it overnight when at home. Much easier to clean! Thanks for the baking soda trick! I’ve never heard of that one. This looks like a great recipe and I’m looking forward to trying it. Could you tell me approximately how long after the first 25 minutes the chicken will need to roast at the reduced temperature? I know that it will depend on the size of the bird, but a guesstimate would be helpful. Hi, I use a meat thermometer, but, to be honest, I always cook mine longer than when it reaches 165. I wait until the juices are running clear and the skin looks crisp. When I use the thermometer at this point, it is usually around 175-180. I made one tonight, and I let it roast for about 1 hour and forty five minutes total. When I removed it from the oven, the thermometer read 180. The chicken was around 4-5 lbs. Thank you. Your recipe does indeed sound like it will produce a roasted chicken with the delicious taste and cooking of a rotisserie chicken. First of all, I put aluminum foil in the bottom of the baking dish, usually a 9 x 13 glass dish. Easy cleanup! I pour a little olive oil and fresh lemon juice and whatever herbs I want (minced garlic, oregano, rosemary, salt, pepper, Italian herb blend) into a big bowl, roll chicken around in it until covered all over. I then stuff it with whole garlic cloves, onion halves, lemon quarters, and fresh rosemary sprigs. I also put a few pieces of sliced garlic under the skin. Place on rack in the baking dish, bake at 275 degrees F for 4 hours. Since a friend told me about roasting a chicken this way I have been doing it once a week, and have never tasted chicken as tender and moist as this. The low temperature and 4 hour baking time is the key. Great tips, thanks! I will have to try stuffing it with the garlic cloves. That sounds like it will produce great flavor!